Birthdays come once a year and the Peter Pan Birthday Club of Maria Fareri Children's Hospital at Westchester Medical Center exists to empower children with the joy of giving. 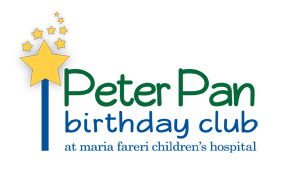 Donations to Maria Fareri Children's Hospital made through the Peter Pan Birthday Club will help meet the needs of critically ill and injured children at Maria Fareri Children's Hospital, the advanced care pediatric facility for New York's Hudson Valley and Fairfield County, Connecticut. Either a hospital wish list or donation envelopes. Schedule a conversation with Tricia Hiller, Director, Maria Fareri Children's Hospital, Child Life & Creative Arts Therapy, by calling 914-493-6657 and/or sending an email to hillert@wcmc.com. Decide whether your child will make a monetary donation to Maria Fareri Children's Hospital or donate gifts via a provided wish list. Distribute invitations (provided by the hospital or your own) accompanied by either a provided wish list or donation envelopes. Enjoy your child's birthday celebration! Arrange for the delivery of gifts and/or donation envelopes. Smile knowing that your child has made a difference in the lives of ill and injured kids! Additionally, you may register your child as a national Peter Pan Birthday Club member online. Maria Fareri Children's Hospital at Westchester Medical Center has a partnership with the Peter Pan Children's Fund, a national organization that encourages philanthropy by kids, adolescents and adults in support of children's hospitals. The Peter Pan Children's Fund encourages children to share their philanthropy experiences via cards, drawings and photographs. After completing a short online application, the Peter Pan Children's Fund will send an order of Peter Pan Crest Pins and an official Peter Pan Birthday Club certificate to your child. In addition, the Peter Pan Children's Fund will make an additional $100 donation to the Child Life and Creative Arts Therapy Department of Maria Fareri Children's Hospital at Westchester Medical Center in your child's name.